Galway-West of Ireland, when embarking on their European Region of Gastronomy journey two years ago, boldly proclaimed their aim to reach into local communities and develop a vision for Galway Gastronomy, involving farmers, fishermen, producers, small businesses, health workers, teachers, parents and children; in short, everyone! On Friday 16 of March, Galway-West of Ireland, European Region of Gastronomy 2018 officially launched their title year and flagship programme of events entitled From the Ground Up, Feeding our Future. The Region was awarded the prestigious title almost two years ago, and since then organisers have been preparing to tackle the various key objectives established in their bid book. The outdoor and family-friendly launch event, held at Galway City’s iconic Spanish Arch, began with a formal opening ceremony involving IGCAT’s President, representatives from North Brabant (the Dutch region sharing the accolade this year), key public figures, local stakeholders and members of the public. The occasion presented an opportunity for organisers to outline their plans for the coming year whilst showcasing the region’s local producers and unique gastronomic culture to partners, locals, as well as both local and national media. Organisers explained how they are also seeking to use the Award to raise awareness of Galway’s natural and rugged beauty on the Atlantic coast, showcasing varied landscapes and a unique bounty of marine heritage and produce, such as seaweed, sea herbs and shellfish. The title year and programme also plan to raise international visibility for the youthfulness and the rich cultural diversity of Galway’s people, which is epitomised by the presence of Ireland’s largest Irish speaking community (Gaeltacht) in the region. Galway has expressed a strong commitment to fostering the following focus areas; sustainability, citizen inclusion, education, supporting small business and re-connecting urban and rural environments. In receiving the Award, Galway has become a key partner in the Platform of past, current and future European Regions of Gastronomy. It was fitting, therefore, that the launch event was attended by European Region of Gastronomy partners from North Brabant Peter deBoer and Anja Van Hout (North Brabant 2018). They outlined their commitment to working with and learning from Galway’s excellent food experiences. The event was also attended by key stakeholders from Teagasc (Agri and Food Development Authority), Galway County Council and Galway City Council. Galway’s title year arrives two years before the region is also due to hold the prestigious designation of European Capital of Culture, and stakeholders and organisers present further committed to supporting and collaborating with organisers to ensure sustainability and local food products become a feature in cultural events unfolding for 2020. Galway’s launch event was held on a very fitting occasion, taking place at the beginning of the St Patrick’s Day Weekend Festival celebrations. After the formalities of Friday’s opening ceremony, attendees were treated to an authentic Irish group-dancing session, called a ‘céilí’. The launch event was widely covered by local and national media, with Ireland’s national TV channel RTE running a segment on their popular ‘Nationwide’ programme. Dr Diane Dodd, IGCAT’s President emphasised that Galway should be very proud and take this opportunity to celebrate and blow their trumpet. She also congratulated them for their variety and quality of local food producers, the great hospitality and the plan to build a long-term legacy for the region. Anja van Hout from North Brabant went on to explain the significant importance of the Platform as a learning process and opportunity to cross-market. She also made the announcement that the European Commission has just yesterday approved funding for the Platform to develop their work together through the Interreg Europe budget line. 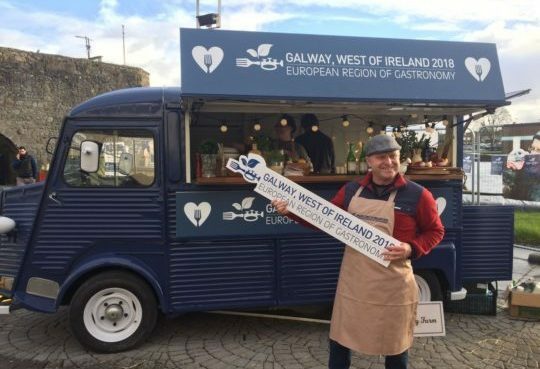 Those in attendance could see that Galway serves as an exemplar of the spirit of the Region of Gastronomy Award, and the programme of events planned encouraged a great sense of pride, excitement and anticipation amongst locals. One such example on display during the launch event was Galway-West of Ireland’s Food Charter, a collective initiative which commits businesses to participate at flagship events, promote the Region of Gastronomy Platform, train staff, source local produce, adopt high service standards, complete a local food waste study and contribute to social media campaigns. The European Region of Gastronomy Platform and Award aim to contribute to better quality of life in European regions, by highlighting distinctive food cultures, educating for better health and sustainability and stimulating gastronomic innovation. IGCAT (International Institute of Gastronomy, Culture, Arts and Tourism) organises the award with the support of European institutions. IGCAT is a non-profit organisation established in 2012 working in the fields of gastronomy, culture, arts and tourism. Through its worldwide network of experts, IGCAT aims to empower local communities by guiding, facilitating, and supporting local leaders in cities, regions and cultural projects to understand the potential of their distinct food, culture, arts and sustainable tourism assets. IGCAT is the official secretariat for the Region of Gastronomy Platform and provides the European Region of Gastronomy Award, the European Young Chef Award and the Local Food Gift Project.